Click the image to watch "About Fallout," a 1963 film by the Office of Civil Defense. 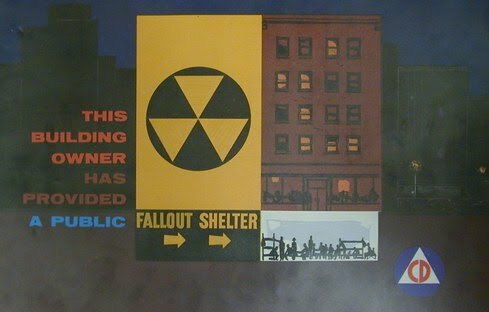 To learn about fallout shelter design, click on the image. [i] Community Shelter Plan Study for Washington, DC, Volume I: Plan Study and Recommendations, Washington, D.C.: Government of the District of Columbia, Office of Civil Defense, 1965, 93. [iii] Community Shelter Plan Study for Washington, DC, Volume I: Plan Study and Recommendations, Washington, D.C.: Government of the District of Columbia, Office of Civil Defense, 1965, 2. 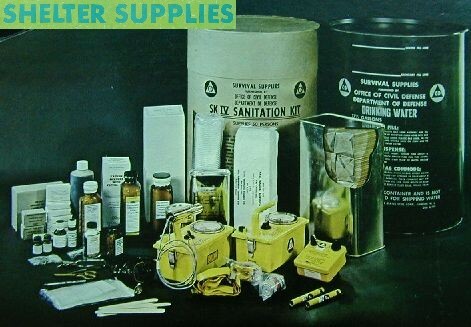 [v] Civil Defense 1965 MP-30, Washington D.C.: United States Department of Defense, Office of Civil Defense, 1965, 15. [vi] Community Shelter Plan Study for Washington, DC, Volume I: Plan Study and Recommendations, Washington, D.C.: Government of the District of Columbia, Office of Civil Defense, 1965, 2. [vii] Annual Report of the Office of Civil Defense for Fiscal Year 1965, Washington D.C.: United States Department of Defense, Office of the Secretary of the Army, 1965, 23. [viii] “103 Shelters Licensed, Five Are Ready for Use,” The Washington Post, October 26, 1962, p. A14. Community Shelter Plan Study for Washington, DC, Volume I: Plan Study and Recommendations, Washington, D.C.: Government of the District of Columbia, Office of Civil Defense, 1965. [ix] Community Shelter Plan Study for Washington, DC, Volume I: Plan Study and Recommendations, Washington, D.C.: Government of the District of Columbia, Office of Civil Defense, 1965, ix, 4. [x] Community Shelter Plan Study for Washington, DC, Volume I: Plan Study and Recommendations, Washington, D.C.: Government of the District of Columbia, Office of Civil Defense, 1965, 4, 7, 33. [xi] “D.C. Has 928 A-Shelters,” The Washington Post, June 30, 1964, p. B7. [xii] “28 Schools Listed Here For Shelters,” The Washington Post, September 13, 1962, p. A10. [xiv] “103 Shelters Licensed, Five Are Ready for Use,” The Washington Post, September 13, 1962, p. A14. [xv] “Bangladesh Hungry to Get Biscuits Kept in CD Tunnel,” The Washington Post, September 13, 1962, p. D1. [xvi] Community Shelter Plan Study for Washington, DC, Volume I: Plan Study and Recommendations, Washington, D.C.: Government of the District of Columbia, Office of Civil Defense, 1965, 32. [xvii] Community Shelter Plan Study for Washington, DC, Volume I: Plan Study and Recommendations, Washington, D.C.: Government of the District of Columbia, Office of Civil Defense, 1965, 54. [xviii] “103 Shelters Licensed, Five Are Ready for Use,” The Washington Post, September 13, 1962, p. A14.